For the 66th time, Midvale Speedway opened its gates to drivers, crews and spectators on a beautiful Saturday afternoon. A couple of first career wins, a couple second career wins and a return of a Champion were the stories of McIntosh Oil Company opening night. Sixty Four machines were pit side under sunny skies with a temperature of sixty seven degrees at race time. The first feature of the season to hit the 3/10 mile oval was the McIntosh Oil Company Late Model's for their 30 lapper. George Riddle in the #0 and the #1 of Steve Black brought the field to Chief Starter Terry Colletti's green flag. Riddle led lap 1 as Black hung on the outside for the opening circuit. As Riddle cleared Black off turn two, "The Birthday Boy" Ryan Tedesco, was able to slide his #701 by Black for second. As Tedesco set his sights on Riddle, Tony Urdiales in the #88 and fastest qualifier Albert Francis in the #33 were marching towards the front. On lap 4, the duo were able to get around Tedesco for second and third as Tedesco struggled with the handling of his machine. On lap 8, Francis got a good run off of turn four and was able to get to the inside of Urdiales for second. A lap later, he was able to get around Riddle to take the top spot. Urdiales, Tedesco and Bob Schneider in the #17, were also able to make their way by Riddle. Schneider showed some strength in the middle stages of the event as he was able to get by Tedesco to take over third on lap 14. Francis had built up a 2.1 second lead by lap 19, until Schneider looped his machine off turn two, bringing out the races first caution. On the restart, Francis was able to race back out front as Tedesco followed him around Urdiales, who was stuck on the outside. After a long winter, it usually takes a few weeks for that outside lane to come in and it showed that all night long. The final caution would fly on lap 22 as Riddle would spin in turn two. Francis and Tedesco would start side by side on the final restart. Tedesco gave a valiant effort, but the #33 was bolted to the race track right off the trailer. The 16 year old would drive off into the night to pick up his first career feature victory in impressive fashion. Following the Painsville OH driver in the Francis Engineering, Habco Tool & Development, Legan Trucking, McIntosh Oil Company, Eastern Excavating, Hemly Tool & Supply and Lawson Tree Service sponsored #33 was Urdiales, Tedesco, Black and Schneider. The Finlayson Towing Compact 15 lap fast feature was up next, with Trevor Kohl in the #64 and the #0 of Alan Clark on the front row. Brandon France, the 2018 Champion was unable to make the event due to a mechanical issue, all of the Champions from last season, seemed to struggle on opening night. Clark was able to pop out to the race lead and was looking sporty up front with the #69 of Bart Busby, filling in for Dan Buckey, and Kohl close behind. The worst incident of the night took place on lap 3. The #23 of Karl Phillips had an issue in turns one and two and hit the yuke tires that protect the pit entrance in turn two. He sent one of the tires clear down into the pit area and completely knocked over a section of the concrete barrier. Phillips was ok and surprisingly, it didnt appear to damage his car much at all besides the radiator, which ended his night. After a lengthy delay to repair the wall, Clark and Busby restarted side by side. Busby was able to take the lead off of turn two. The man on the march was last seasons Fall Classic feature winner, Brent Shreffler in the #24. He made a 3-wide move on Clark and Jeffrey Orr in the #8 to take over second. On lap 6, he took the point. After starting 10th, he ripped through the field and was driving away. He was missing a heck of a race for second behind him as Busby, Orr, Clark and fastest qualifier Kyle Finlayson in the 15 were putting on a great show. That scrum would continue to the finish, but it was all behind Shreffler who was almost a full straightaway gone. Shreffler finished off 2018 with a win and he would get things started the right way in 2019, pulling in to Naak Tuning Victory Lane. Following the New Philadelphia OH driver in the Canton Auto Salvage, Bowling's Used Cars, About Your Comfort Pest Control, Paw Print Vinyls, Shutterbug Photography by Dana, Stock Boarding Kennels and Finlayson Towing sponsored #24 was Busby, Orr, Clark and Finlayson. Phillip Cox in the #09 and Rick Sibila in the #02 led the Vanmeter Auto Repair Modified's down for their 25 lap feature. Sibila, a former Late Model Champion at Midvale, would take the lead from the outside lane with Cox and Mike Stone in the #331 close behind. The first caution flew on lap 4, as the #24 of Nick Grubbs pounded the front straightaway wall off turn four. On the restart, Doug McMillen in the #54 got deep into turn three, but it was too deep. He made contact with Cox, bringing out another yellow flag. McMillen was sent to the tail. Siblia would continue to pace the field after the green flag flew once again. Stone was able to clear Cox for second. Lucas Ripley in the #0 was on the charge from his 7th starting position, taking over third on lap 9. As the front three tightened up, the final caution flew on lap 11 for a Derek Grewell spin off turn two. Stone would get a great restart and hung on in the outside lane for a lap, but Sibila was able to prevail in the preferred inside groove. As Sibila scooted out front, Stone fell into the clutches of "The Big Dawg" and the Dawg was hungry. Ripley would take over second and began to work on Sibila. He tried several times to get a run off the corner to the inside but the #02 was strong down the straightaway. Ripley also took several looks at the second lane, but the outside just wasnt there. Sibila, driving for the Bowers family, hasnt competed much at Midvale since his Late Model title in 2012, but you wouldnt have know it by watching. Following the Massillon OH driver in the Tim's Custom Car Center, Keiffer Auto & Truck Parts and Sibila Fabrications sponsored #02 was Ripley, Bob Page, Brandon Bailey and Stone. The second Finlayson Towing Compact 15 lap feature had the #96 of Chris Caldwell and the #4E of Tyler Eichel leading the field to the green flag. Savanna Alm in the #7s immediately went to the inside of the front row and shot into the lead. Her brother Ryan in the #6R moved into second on lap 3 and looked to run his sister down. Ryan got a good run to the inside of Savanna off turn two and got to her door. Savanna tried to stall out the move and the two made contact, bringing out the caution. Savanna was charged with the caution and sent to the tail, Ryan would assume the top spot with the #9 of Gavin Roup to his outside. On the restart, Ryan was able to jump back out front and pull away. The Alm's came to Midvale Speedway about Mid-season last year from dirt racing and I think that both teenagers have found a home on asphalt. Alm would pull into Naak Tuning Victory Lane for the first time in his young career. Following the East Canton OH driver in the B&S Motorsports and Long Fasteners sponsored #6R was Roup, Curtis Finlayson, Laney Striejewske and Savanna. The Buckey Mowing Street Stock 20 lap feature was an exciting one. The #22 of Kylee Wood and the #55 of Robbie Kordiac brought the field down for the start. Kordiac would prevail on the outside off of turn number four, to lead the opening lap. Colt Locker in the #118 was able to clear Kylee and move up to second and Kyle Gove in the #8 followed him to third. On lap 4, Jeff Kuykendall in the #12 was able to get around Grove and move to third. The field settled down as the front 5 ran nose to tail until Kuykendall ducked to the inside of Locker for second on lap 10. The only caution flew on lap 14 for a Mark Lushes spin off turn two in the #21. The final 6 laps were exciting between the top 5 or 6 machines. They all remained side by side and locked together. Kuykendall worked hard in the outside lane and Kordiac didnt make it easy. If the #12 was going to make the pass, he was going to have to earn it. The two traded a little paint in a hard battle, each looking for their first win at Midvale, Kordiac his first career win. Kuykendall worked that outside lane over the last 6 laps but it's just not there yet. Grove was able to squeeze by the #12 for second after he clipped the wall off of turn four. Kordiac would hang on to capture his first career feature victory, leading wire to wire. Following the Uhrichsville OH driver in the Efficient Energy Group, Hidden Hollow Kennels, Keeping You In Stitches and Affordable Towing sponsored #55 was Grove, Kuykendall, Jeremy Wiggins and Lushes. The final feature was the 10 lap Snap-on Tools by Doug Pool Mini Truck feature. Bill Scott in the #11 and Scott Lindell in the #19 brought the field to the strip. Scott, who was off the pace the couple races he competed in last year, took the lead off turn two and looked strong. On lap 2, Barney Gerber in the #2 moved to second and Tim Scott in the #4 moved to third. Scott would swing to the outside of Gerber for the runner up spot. It took a couple laps, but Tim would inch past Gerber on the outside and up along side his brother for the lead. Bill and Tim battled for the top spot for several laps until Tim was able to clear Bill off turn two on lap 7. That opened up a lane for the fastest qualifier, the #443 of Eddie McLean. McLean immediately started to put pressure on Tim for the top spot as Michael Varnes in the #95 moved to third. McLean took a few shots at Scott, but ran out of time. 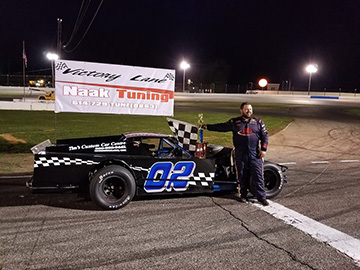 Tim Scott rolled into Naak Tuning Victory Lane for the second time in his career. Completing the top 5 behind the Sunbury OH driver in the Scott's Speed Shop sponsored #4 was McLean, Varnes, Gerber and Bill. It was another successful night at Midvale Speedway and we cant THANK all of our sponsors, drivers, teams, officials, volunteers and FANS enough for your support and dedication!! We have a few early season gremlins that we are working out and we hope to have them corrected as soon as possible!! This Saturday April 20th is Autism Awareness Night and everyone is encouraged to WEAR BLUE in support of Autism Awareness!! All 5 regular divisions will be back in action and we hope that everyone heads back next week and you bring a friend!! SUPPORT YOUR LOCAL RACE TRACK!! 9 16 52 . .
5 1 52 . .